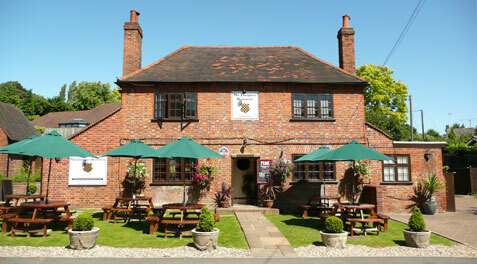 I was running the Marlow Half-Marathon last weekend and was therefore looking for a nice place to celebrate with Claire. 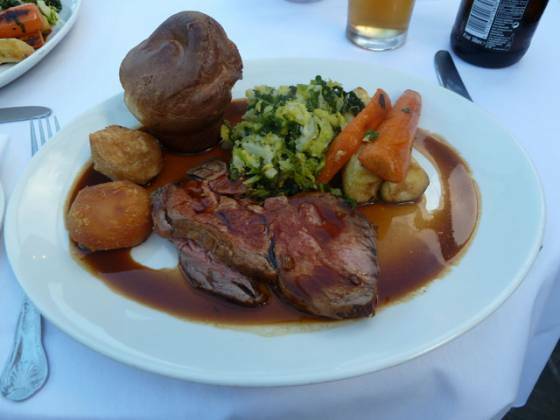 After much deliberation, I settled on a Sunday roast at Chequers Brasserie in Cookham Dean (Marlow). Reserving a table was easy, a quick telephone call a week before and we were all ready. So, after my run (and a shower), we set off to find Chequers Brasserie. Through the lovely countryside, up and down a number of hills, around the corner and straight past the restaurant! A quick smile, a 3 point turn in the country road and we arrived (with plenty of parking). First impressions were very good with a couple of pub benches outside for the smokers and a nice wooden door for the entrance. Upon opening the door, we were greeted straight away by a waiter and waitress. We had arrived half an hour early but this was not a problem and was seated straight away (although we could have sat at the bar for a drink beforehand if we wished). Our table was next to the entrance, with a tea-light candle (already lit) and fresh flowers. We were also right next to the real-flame fire! As it was a very sunny day and with the sun streaming through the windows onto our table and backs we were feeling a bit uncomfortable so when the waitress came over to take our order, I asked if we could move. This was handled without hesitation and we moved straight away into the conservatory. The environment was nice and relaxing, with a decorative birds cage in corner as well as works of art (for sale) on the main wall. Drinks orders were taken first (a nice selection of drinks ranging from good quality wine to less common alcoholic options such as Crabby’s Ginger Beer). After a couple of minutes more, the waitress came and took our order, Claire went for the roast port, I chose the beef. The food arrived a short while later and wow, it looked fantastic! My beef was served with a great looking Yorkshire pudding, appearing almost like a muffin. The savoy cabbage was nicely shredded, the large honey roasted parsnips and carrots were cut length-ways into quarters. 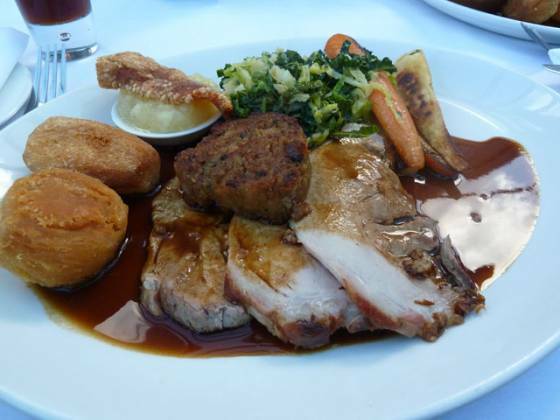 Claire’s pork came with a huge piece of crackling and apple sauce in a small dish on the plate, as well as stuffing! The gravy was plentiful with lots of flavour. Last, but definitely not least, the roast potatoes; only a couple on the plate but crisp and crunchy on the outside with a very fluffy middle. A marvellous selection of desserts and after-dinner drinks were available. Damson & Sloe Gin Ice Cream or perhaps Pink Grapefruit and Cucumber Jelly with Blood Orange Ice Cream & Popping Candy takes your fancy? Drinks-wise, a huge selection of Teapigs including Chamomile, Hot Chocolate Tea, and Silvertip (all for around £2.75). I went for the Sticky Toffee Pudding with Vanilla Ice Cream. Claire, after much deliberation, chose a black coffee. A couple of minutes later, Claire’s freshly brewed coffee came out with two chocolate coins and also biscotti on the side. My dessert came out shortly afterwards, a slice of pudding with a scoop of ice cream, some berries sitting on top and sitting in a pool of toffee gravy. Excellent. A member of staff saw our table was slightly wonky. When he tried to have a look, Claire’s coffee spilt on the saucer; without hesitation, they replaced the coffee straight away. When the waitress brought the bill out two small pieces of sugary rock were also included. It’s extremely difficult to fault Chequers Brasserie, the staff were extremely welcoming, accommodating, helpful and professional. The food presentation was excellent and quality probably the best we have ever had. This is definitely the benchmark for any other Sunday roast. It was a pleasure eating here and I look forward to going back with friends and family.